Was trying to think of a Christmas themed communal living post to do – I first thought I would do a piece on different gift ‘games’ that people living communally play to try and make the festive season more co-operative and less commercialised, but when I looked at the various ideas they are not that particular to communes. (We play the ‘Pink Elephant game’ on solstice eve at Forgebank – a variation on White Elephant, or Yankee Swap, that we learnt one xmas at Twin Oaks.) So instead I googled ‘Christmas Commune’ and came across the mysterious story of the Christmas Tree Island Commune, a story of free-spirits, a squatted island and murder! The island is a bit of a mystery itself. 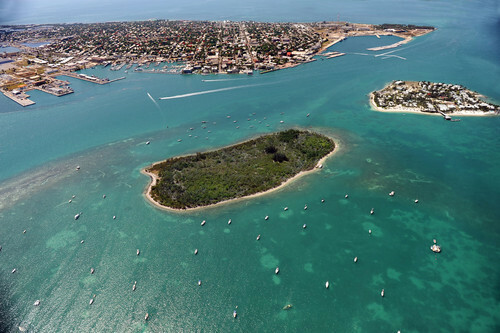 For starters it is a 21 acre man made island created from the spoil from repeated dredging of the Florida Key West harbour by the U.S. Navy in the late 1890s and early 1900s. 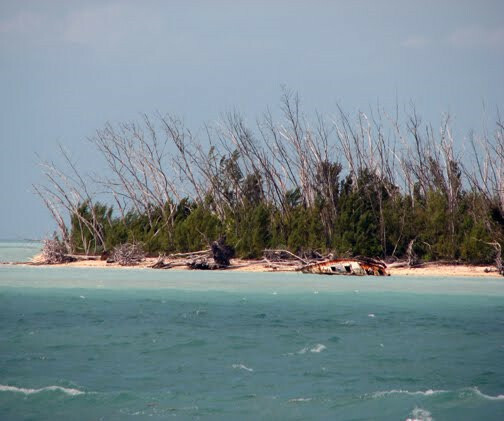 The dredging created two islands a few hundred yards off the coast one named Tank island and the other nicknamed Christmas Tree Island after the large number of the invasive Australian pine (casuarina) trees that colonised the island. The island is also known as Wisteria island after the U.S. Public Health Service steamer Wisteria was wrecked whilst moored by the as yet unnamed spit of land in 1925. The island has had a chequered use and ownership history. In the 1930s & 40s it was base for a shark hunting business that sold the shark skins to be made into clothing leaving the beach on the island peppered with thousands of sharks teeth. In the 1950’s the Navy had various plans to use the island which ended up being shelved. While a local official bought the island and started a long chain of ultimately disputed ownership. In 1956 the first plans to develop the island for housing and commercial space were put forward, followed in 1966 with plans for a 60-home development complete with a small golf course, yacht club, dredged canals, and a lagoon in the center of the island. Development of the Island has recently been thwarted following a protracted court case over the legal ownership. One particular ‘beach-bum’ attracted down to Key West was singer songwriter Jimmy Buffet who recorded Christmas Island in 1996. This entry was posted in hippies by chris-coates. Bookmark the permalink.